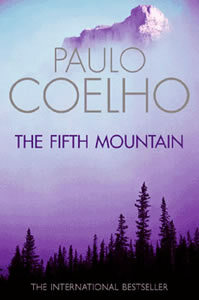 i have started reading Paulo Coelho's The Fifth Mountain. Another beautiful writing i must say, and also an international bestseller. i send my saalams (blessings of peace) to Paulo Coelho. Blessed be your hands. There are so many lovely lines in the novel. Let me quote here. "Who is God? Elijah continued ... (why) Does God kill the faithful, the innocent, those who follow the law ... ?" Levite replies, "God is all-powerful. if He limited Himself to doing only that which we call good, we chould not call Him the Almighty; He would command only one part of the universe, and there would exist someone more powerful than He, watching and judging His acts. In that case, I would worship that more powerful someone." "If He is all-powerful why doesn't He spare the sufferings of those who love Him? Why doesn't He save them, instead of giving might and glory to His enemies?" "I don't know", said the Levite, "But a reason exists, and I hope to learn it soon."